If you need a replacement tub installed in a bathroom of your home in Richmond, Virginia, or any surrounding community, trust MR. FIX-IT™ to get the job done right. As a local home remodeler that has been in continuous operation since 1970, MR. FIX-IT™ brings an unparalleled level of knowledge and expertise to every project, enabling us to install a new replacement tub in your home quickly and professionally. Our dedication to providing you with attentive, prompt service has helped us earn an A+ rating with the Better Business Bureau, so you can rest assured that when you call us, you’ll be working with the very best. 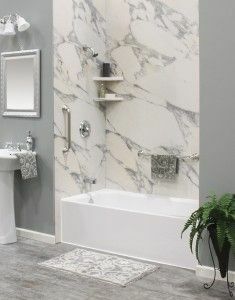 At MR. FIX-IT™, we offer a variety of bathroom remodeling products from Bathwraps, including free-standing tubs, walk in tubs, and even shower to tub conversions. All of these replacement tub products are made out of non-porous acrylic and are treated with Silver Shield™ anti-microbial protection, helping to prevent the growth of bacteria and the buildup of mold and mildew. What’s more, each of these replacement tub products has a number of features designed to improve its functionality and safety, helping to provide you with an optimal bathing experience. For additional information about our selection of replacement tub products, contact MR. FIX-IT™ today. In addition to bathtubs, MR. FIX-IT™ can also provide other options to give your bathroom a quick and affordable upgrade, including replacement shower options, tub to shower conversion kits, shower liners, and walk in tub installation. If your intended project is a bit more involved, MR. FIX-IT™ can also complete comprehensive bathroom remodeling jobs, including new countertops, tiling and grout work, toilet installation, plumbing, vanity installation, ductwork, and more. We proudly serve residents in Richmond, VA, and all other nearby communities.